You can now enjoy this classic title with 2DOF TrackIR view control, thanks to the efforts of Gabriel Lazar ('Gabi Laser'). To use TrackIR with Red Baron3D download the utilities 'ReLoad' and 'TViewMP' via the download links further below. Once you have a flight going, you just need to use the "Insert" key to enable TrackIR support. It is possible to have multiple copies of Red Baron 3D on the harddrive. Even without installation each copy will run properly. Install the game one time and patch it to the 1.0.7.8 version. Copy the .vol files from the RedBaron3D\Data folder on the CD ROM to the RedBaron3D\Data harddisk folder. Thus you do not need CD ROM for playing. Test the installation if it runs successfully. After that make a default copy of the installation folder. Now you could even uninstall the original game installation because you have a working copy. In the next step make multiple copies of the default copy folder and rename the folders appropriately. See screenshot. 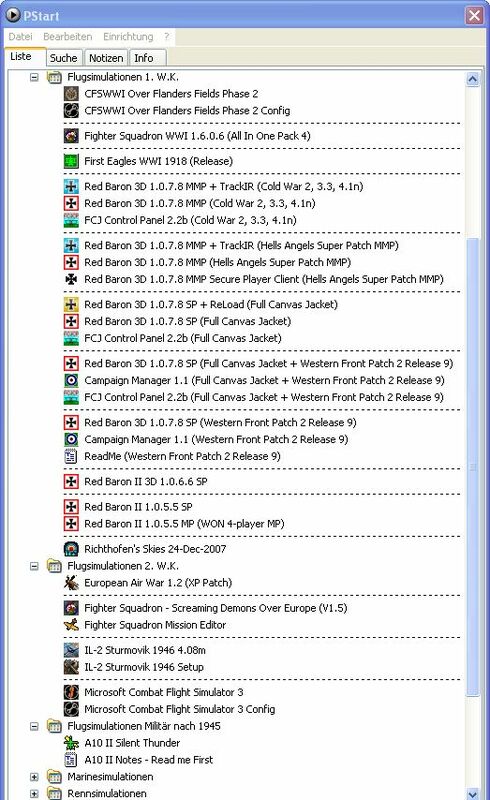 Then you can install your different patches into the different Red Baron 3D folders. 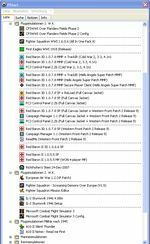 To make a start menu of games and applications which are not installed you can use a little utility called 'PStart' (Download). It does not need an installation either and acts as a program launcher. It is very flexible. If you follow the above instructions you can move the software from harddisk to harddisk or from computer to another computer without the hassles of time consuming installation and configuration work. Easy. It is possible to play Red Baron II/3D without CD in the CDROM drive. Note: Red Baron II as opposed to Red Baron 3D does not contain a file 'data1.dat' in the 'single' folder. Just leave it at that. When the window pops up with the message 'Red Baron II/3D disk is missing' just click 6 times on the iron cross in the right upper corner of the pop-up window and you are set. Another possibility is to alter some entries in the Windows Registry. Start 'Regedit' and make the appropriate entries for Singleplayer and Multiplayer mode as follows. First you need to copy all .vol files from the CDROM to the installation folder. [HKEY_LOCAL_MACHINE\SOFTWARE\Sierra On-Line\Red Baron 3D Multiplayer] "cddir"=".\\"
Double click cddir -> edit string -> copy/paste -> "cddir"=".\\" and enter in the value. If your CD drive letter was for example E:/ it should look like this after the changes are made: "cddir"=".\\"
After installation of Red Baron II or Red Baron 3D on Windows XP there may be issues with video, sound, joystick, and game speed. The solution to those problems may be to use the Red Baron 3D First Aid Kit developed by Klay Pijon. This should help you to get RBII or RB3D running on Windows XP. For setting up dgVoodoo Glide emulator for Red Baron 3D you may want to try the latest dgvoodoo 1.5beta2 from http://dege.freeweb.hu/. For the rest of options, use the other settings as recommended by Polovski's guide at http://www.polovski.com/FAQ/dgvoodoo.htm. Results may vary and are depending on the graphics adapter. The settings will be written in the glide2x.dll file. Just copy this file into your Red Baron 3D folder after each change in the settings. You either use CM11's option 'date based patches', or ReLoad's one. As they work differently, they are very incompatible - e.g. once you used CM11's option, you cannot use ReLoad's one unless you reset your RB install. So, don't use ReLoad's 'check date dir' option. Only if you can't run CM11, or want to make a quick 'ready-made RB install' for a unknowledgeable friend :) , you can prepare a setup that doesn't use CM, but can run WFP2 through ReLoad only (for more details, pls see the ReLoad.chm doc, including the Changelog section).